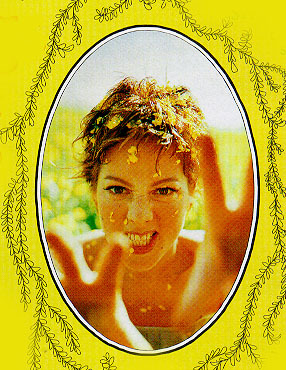 Born on January 28th, 1968, Sarah McLachlan has reached a level of artistic maturity that most artists take years to attain. Since releasing "Touch" in 1988, the Halifax, Nova Scotia native has explored her own unique musical interests, indifferent to current trends and fads. Sarah's intimate vocals and moody, evocative songs convey a passionate honesty rarely found in most of today's music. Sarah studied classical guitar, piano, and voice as a child and at the age of 17 was discovered by Nettwerk Records at her first performance as part of a New Wave band. Reluctant parents kept Sarah from signing her first record deal for two years. After relocating to Vancouver, Sarah began writing music for her first album, "Touch". Much to Sarah's surprise, the album went Gold in Canada and she was suddenly rocketed to stardom and hailed as that year's most exciting and important new artist. The release of "Solace" was followed by an exhaustive 16 month tour after which Sarah returned to Vancouver to begin writing songs for her latest album, "Fumbling Towards Ecstasy". With the release of "Fumbling...", Sarah has unveiled a more personal album: the culmination of six months in a Montreal studio with long-time friend and producer, Pierre Marchand. Her latest release reflects the many changes she has undergone since the release of "Solace". Sarah describes the writing of "Fumbling..." as, "a kind of therapy", a process which enabled her to overcome many long standing fears and concerns by articulating them in her music. Metaphorically, "Fumbling..." represents the stripping away of the things that prevent us from achieving happiness and fulfillment. The Songs on "Fumbling..." examine issues of self-deception and self-actualization from many different perspectives. "Possession", the album's dark and driving lead track was written from the perspective of obsessive fans. It examines a fan's overwhelming need to control someone they know only through music. Blind promises of love are intertwined with images of desperation and violence to create a tense and threatening mood which is underscored by the track's propulsive rhythm and raw guitar. "Hold On" was inspired by the documentary, "A Promise Kept", about a woman whose fianc discovers he has AIDS. Overwhelmed by the woman's strength and selflessness, Sarah wrote the song in a single day. It is an unsentimental portrait of a woman's courage in the face of adversity. "Hold On" appeared on the "No Alternative" compilation album (a follow-up to the very successful "Red, Hot & Blue" and "Red, Hot, & Dance" compilations). The proceeds from all three compilations go to support AIDS research. "Fumbling's" lighter side represents a departure for Sarah. "Before I didn't want to write when I was happy...It was almost as if I needed to be depressed in order to be creative." "Ice Cream", which contains the phrase, "your love is better than ice cream", shows Sarah's new found ability to find inspiration through happiness as well as sadness. Part of Sarah's artistic and personal maturation has been learning to enjoy the good things in life. Still though, "Ice Cream" is tempered by a feeling of the fear of rejection or loss; "It's a long way down" she warns in the chorus. After the whirlwind existence Sarah has lived for the past few years, she is learning to savour the few precious moments of privacy and calm that she gets. While recording "Fumbling...", Sarah rented a secluded house in the woods outside Montreal. At first the solitude and lack of distractions were unsettling, but the natural beauty of the setting eventually soothed and inspired her: "I love to listen to the river. It's the best music I've heard in years".